is the self weeding two paper system to produce vibrant transfers with no residue in the unprinted areas. 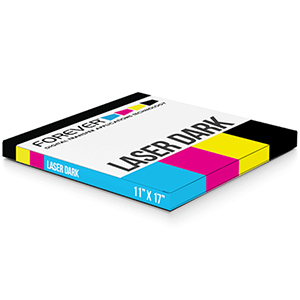 Laser Dark (No-Cut) is the fast and efficient transfer paper which allows you to print full colour, high street quality results onto a vast array of textiles and materials. Such as; Cotton, Polyester, Polycotton, Nylon (T-Shirts, Hoodies, Polo Shirts, Caps, Towels etc) and also Paper/Carton/Bookcovers. Each pack comes with pressing instructions in the package. 12/5/2018 – What is a good printer to use for these? Response From JSISigns: They are mainly used with OKI Laser Printer, but any laser printer with white toner should work great.